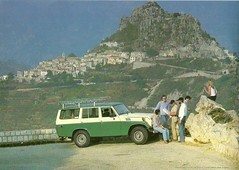 Picture from an advertising brochure for the Toyota Land Cruiser, from my collection of auto advertising. Japanese auto advertising very often makes use of locations, and doesn’t tell you where it is. Usually it is fairly self evident. This one, I would guess, is around the Mediterranean.